Winston-Salem, N.C. — TrueLook, which provides construction cameras combining live jobsite viewing, project time-lapsing, and HD security recording, announced its integration with Autodesk BIM 360 project delivery and construction management software. This is the latest in a sweeping series of software integrations and upgrades for TrueLook. 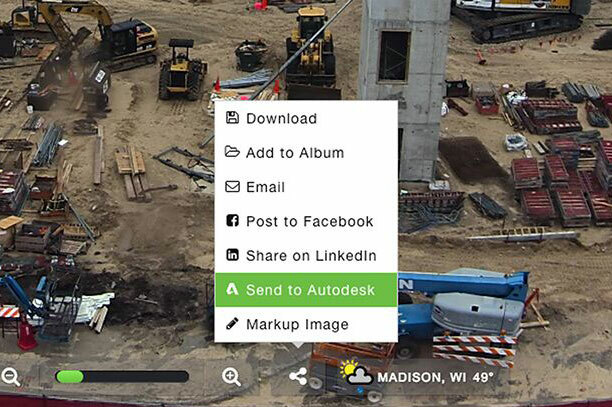 The new integration streamlines TrueLook’s photo interface with Autodesk’s project management software, allowing Autodesk users to view, store and share jobsite photos with contacts or within their Autodesk projects. Additionally, the integration automatically collects and stores TrueLook’s photos and time-lapses into albums in Autodesk BIM 360, serving as a lifetime backup for TrueLook’s project monitoring. TrueLook provides construction jobsite camera technology including live jobsite viewing, construction time-lapses, HD security recording and drone photography. Autodesk’s BIM 360 improves construction project delivery by supporting informed decision-making throughout the project lifecycle. The Autodesk integration is the latest in a series of integrations and hardware upgrades that enhance TrueLook’s offerings for the construction industry. TrueLook will also unveil new camera technology later this year.